Urmi Rahman is a Bangladeshi journalist and author with a Master's degree from Chittagong University. After working for several years on various newspapers and magazines in Bangladesh, she was awarded a UNESCO Fellowship to Michigan State University and to the Press Foundation of Asia in Manila, Philippines. In 1985 she joined the Bengali Section of BBC World Service in London as a producer-broadcaster and remained with them for eight years, before leaving to work in local government in London. 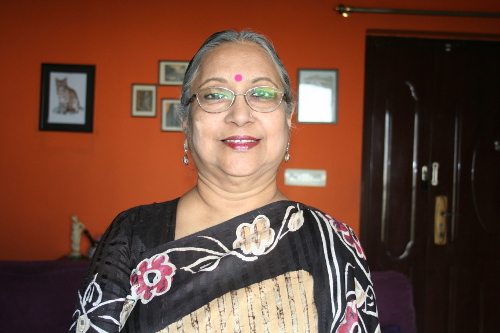 Urmi has published a number of books, both fiction and non-fiction, and has translated several books from English to Bengali. She now lives in Kolkata with her Indian husband, and regularly contributes to newspapers and journals in both Kolkata and Dhaka. Urmi has a number of publications to her credit, which include books, both fiction and non-fiction, short story collections, children's story books and other books on different topics. These include, a title on Bengalis living in Britain (Bilete Bangalee: Shongram O Shafolyer Kahini), feminism in the West (Pashchatye Nari Andolon) and on war crimes in different countries (Juddhaporadh Deshe Deshe). Her latest book is based on interviews of distinguished personalities from Bangladesh and West Bengal (Atmokothone Shamay O Srijon Kotha). She has translated some books from English to Bengali, one of them is the translation of A;Question of Women's Liberation by American feminist-anthropologist Evelyn Reed (Narimuktir Proshne). One of her short stories was adapted for a TV drama that was telecast in a popular Bangladeshi Television channel. Urmi has written B is for Bangladesh, a pictorial children's book published by Frances-Lincoln and;Culture Smart! Bangladesh. One of the best time to visit Bangladesh is during the Bengali New Year celebration. It is one of the largest celebration. It is a cultural and secular festival. It falls normally into 14th of April. It will be 15th April, if it is a Lip Year. You can enjoy the very early morning musical programme under a big tree in Ramna Green, at the heart of the capital Dhaka. All day long there will be melas (fairs) and cultural functions. You can roam the city and see some beautiful street painting Alpona. After you have arrived in Bangladesh, you can step outside where you are staying and can join the happy celebration.